Dietary factors are of paramount importance in the management and prevention of type 2 diabetes. Despite progress in formulating evidence based dietary guidance, controversy and confusion remain. In this article, we examine the evidence for areas of consensus as well as ongoing uncertainty or controversy about dietary guidelines for type 2 diabetes. What is the best dietary approach? Is it possible to achieve remission of type 2 diabetes with lifestyle behaviour changes or is it inevitably a condition causing progressive health decline? We also examine the influence of nutrition transition and population specific factors in the global context and discuss future directions for effective dietary and nutritional approaches to manage type 2 diabetes and their implementation. Diabetes is one of the biggest global public health problems: the prevalence is estimated to increase from 425 million people in 2017 to 629 million by 2045, with linked health, social, and economic costs.1 Urgent solutions for slowing, or even reversing, this trend are needed, especially from investment in modifiable factors including diet, physical activity, and weight. Diet is a leading contributor to morbidity and mortality worldwide according to the Global Burden of Disease Study carried out in 188 countries.2 The importance of nutrition in the management and prevention of type 2 diabetes through its effect on weight and metabolic control is clear. However, nutrition is also one of the most controversial and difficult aspects of the management of type 2 diabetes. Progress has been made in understanding the best dietary advice for diabetes but broader problems exist. For instance, increasing vegetable and fruit intake is recommended by most dietary guidelines but their cost is prohibitively high in many settings: the cost of two servings of fruits and three servings of vegetables a day per individual (to fulfil the “5-a-day” guidance) accounted for 52%, 18%, 16%, and 2% of household income in low, low to middle, upper to middle, and high income countries, respectively.9 An expensive market of foods labelled for use by people with diabetes also exists, with products often being no healthier, and sometimes less healthy, than regular foods. After new European Union legislation, food regulations in some countries, including the UK, were updated as recently as July 2016 to ban such misleading labels. This is not the case elsewhere, however, and what will happen to such regulation after the UK leaves the European Union is unclear, which highlights the importance of the political environment. In some, mostly developed, countries, dietary guidelines for the management of diabetes have evolved from a focus on a low fat diet to the recognition that more important considerations are macronutrient quality (that is, the type versus the quantity of macronutrient), avoidance of processed foods (particularly processed starches and sugars), and overall dietary patterns. Many systematic reviews and national dietary guidelines have evaluated the evidence for optimal dietary advice, and we will not repeat the evidence review.101112131415161718 We focus instead in the following sections on some important principles where broad consensus exists in the scientific and clinical community and highlight areas of uncertainty, but we begin by outlining three underpinning features. 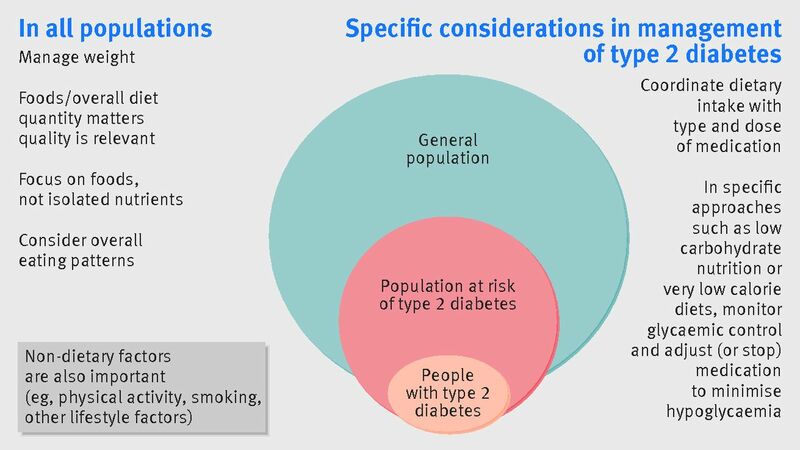 Secondly, it is now recognised that dietary advice for both the prevention and management of type 2 diabetes should converge, and they should not be treated as different entities (fig 1). However, in those with type 2 diabetes, the degree of glycaemic control and type and dose of diabetes medication should be coordinated with dietary intake.12 With some dietary interventions, such as very low calorie or low carbohydrate diets, people with diabetes would usually stop or reduce their diabetes medication and be monitored closely, as reviewed in a later section. Thirdly, while recognising the importance of diet for weight management, there is now greater understanding10 of the multiple pathways through which dietary factors exert health effects through both obesity dependent and obesity independent mechanisms. The influence of diet on weight, glycaemia, and glucose-insulin homeostasis is directly relevant to glycaemic control in diabetes, while other outcomes such as cardiovascular complications are further influenced by the effect of diet on blood lipids, apolipoproteins, blood pressure, endothelial function, thrombosis, coagulation, systemic inflammation, and vascular adhesion. The effect of food and nutrients on the gut microbiome may also be relevant to the pathogenesis of diabetes but further research is needed. Therefore, diet quality and quantity over the longer term are relevant to the prevention and management of diabetes and its complications through a wide range of metabolic and physiological processes. Type 2 diabetes is most commonly associated with overweight or obesity and insulin resistance. Therefore, reducing weight and maintaining a healthy weight is a core part of clinical management. Weight loss is also linked to improvements in glycaemia, blood pressure, and lipids and hence can delay or prevent complications, particularly cardiovascular events. Most guidelines recommend promoting weight loss among overweight or obese individuals by reducing energy intake. Portion control is one strategy to limit energy intake together with a healthy eating pattern that focuses on a diet composed of whole or unprocessed foods combined with physical activity and ongoing support. The evidence points to promoting patterns of food intake that are high in vegetables, fruit, whole grains, legumes, nuts, and dairy products such as yoghurt but with some cautions. Firstly, some dietary approaches (eg, low carbohydrate diets) recommend restricting the intake of fruits, whole grains, and legumes because of their sugar or starch content. For fruit intake, particularly among those with diabetes, opinion is divided among scientists and clinicians (see appendix on bmj.com). Many guidelines continue to recommend fruit, however, on the basis that fructose intake from fruits is preferable to isocaloric intake of sucrose or starch because of the additional micronutrient, phytochemical, and fibre content of fruit. Secondly, despite evidence from randomised controlled trials and prospective studies10 that nuts may help prevent type 2 diabetes, some (potentially misplaced) concern exists about their high energy content. Further research in people with type 2 diabetes should help to clarify this. There is also consensus on the benefits of certain named dietary patterns such as the Mediterranean diet for prevention and management of type 2 diabetes. Expert guidelines also support other healthy eating patterns that take account of local sociocultural factors and personal preferences. Consensus exists on reducing or avoiding the intake of processed red meats, refined grains and sugars (especially sugar sweetened drinks) both for prevention and management of type 2 diabetes, again with some cautions. Firstly, for unprocessed red meat, the evidence of possible harm because of the development of type 2 diabetes is less consistent and of a smaller magnitude. More research is needed on specific benefits or harms in people with type 2 diabetes. Secondly, evidence is increasing on the relevance of carbohydrate quality: that is that whole grains and fibre are better choices than refined grains and that fibre intake should be at least as high in people with type 2 diabetes as recommended for the general population, that diets that have a higher glycaemic index and load are associated with an increased risk of type 2 diabetes, and that there is a modest glycaemic benefit in replacing foods with higher glycaemic load with foods with low glycaemic load. However, debate continues about the independence of these effects from the intake of dietary fibre. Some evidence exists that consumption of potato and white rice may increase the risk of type 2 diabetes but this is limited and further research is needed. Moreover, many guidelines also highlight the importance of reducing the intake of in foods high in sodium and trans fat because of the relevance of these specifically for cardiovascular health. Research to date on weight or metabolic outcomes in diabetes is complicated by the use of different definitions for the different macronutrient approaches. For instance, the definition of a low carbohydrate diet has ranged from 4% of daily energy intake from carbohydrates (promoting nutritional ketosis) to 40%.15 Similarly, low fat diets have been defined as fat intake less than 30% of daily energy intake or substantially lower. Given these limitations, the best current approach may be an emphasis on the use of individual assessment for dietary advice and a focus on the pattern of eating that most readily allows the individual to limit calorie intake and improve macronutrient quality (such as avoiding refined carbohydrates). Dairy foods are encouraged for the prevention of type 2 diabetes, with more consistent evidence of the benefits of fermented dairy products, such as yoghurt. Similar to population level recommendations about limiting the intake of foods high in saturated fats and replacing them with foods rich in polyunsaturated fat, the current advice for diabetes also favours low fat dairy products but this is debated. More research is needed to resolve this question. Type 2 diabetes was once thought to be irreversible and progressive after diagnosis, but much interest has arisen about the potential for remission. Consensus on the definition of remission is a sign of progress: glucose levels lower than the diagnostic level for diabetes in the absence of medications for hyperglycaemia for a period of time (often proposed to be at least one year).3334 However, the predominant role of energy deficit versus macronutrient composition of the diet in achieving remission is still controversial. The permanence of these changes was tested by a nutritional and behavioural approach to achieve long term isocaloric eating after the acute weight loss phase.39 It was successful in keeping weight steady over the next six months of the study. Calorie restriction was associated with both hepatic and pancreatic fat content remaining at the low levels achieved. The initial remission of type 2 diabetes was closely associated with duration of diabetes, and the individuals with type 2 diabetes of shorter duration who achieved normal levels of blood glucose maintained normal physiology during the six month follow-up period. Recently, 46% of a UK primary care cohort remained free of diabetes at one year during a structured low calorie weight loss programme (the DiRECT trial).40 These results are convincing, and four years of follow-up are planned. In a review by the American Diabetes Association, interventions of low carbohydrate (less than 40% of calories) diets published from 2001 to 2010 were identified.15 Of 11 trials, eight were randomised and about half reported greater improvement in HbA1c on the low carbohydrate diet than the comparison diet (usually a low fat diet), and a greater reduction in the use of medicines to lower glucose. Notably, calorie reduction coincided with carbohydrate restriction in many of the studies, even though it was not often specified in the dietary counselling. One of the more highly controlled studies was an inpatient feeding study,50 which reported a decline in mean HbA1c from 7.3% to 6.8% (P=0.006) over just 14 days on a low carbohydrate diet. For glycaemia, other reviews of evidence from randomised trials on people with type 2 diabetes have varying conclusions.515253545556 Some concluded that low carbohydrate diets were superior to other diets for glycaemic control, or that a dose response relationship existed, with stricter low carbohydrate restriction resulting in greater reductions in glycaemia. Others cautioned about short term beneficial effects not being sustained in the longer term, or found no overall advantage over the comparison diet. Narrative reviews have generally been more emphatic on the benefits of low carbohydrate diets, including increased satiety, and highlight the advantages for weight loss and metabolic parameters.5758 More recently, a one year clinic based study of the low carbohydrate diet designed to induce nutritional ketosis (usually with carbohydrate intake less than 30 g/d) was effective for weight loss, and for glycaemic control and medication reduction.59 However, the study was not randomised, treatment intensity differed substantially in the intervention versus usual care groups, and participants were able to select their group. Concerns about potential detrimental effects on cardiovascular health have been raised as low carbohydrate diets are usually high in dietary fat, including saturated fat. For lipid markers as predictors of future cardiovascular events, several studies found greater improvements in high density lipoprotein cholesterol and triglycerides with no relative worsening of low density lipoprotein cholesterol in patients with type 2 diabetes following carbohydrate restriction,15 with similar conclusions in non-diabetic populations.57606162 Low density lipoprotein cholesterol tends to decline more, however, in a low fat comparison diet6163 and although low density lipoprotein cholesterol may not worsen with a low carbohydrate diet63 in the short term, the longer term effects are unclear. Evidence shows that low carbohydrate intake can lower the more atherogenic small, dense low density lipoprotein particles.5764 Because some individuals may experience an increase in serum low density lipoprotein cholesterol when following a low carbohydrate diet high in saturated fat, monitoring is important. Another concern is the effect of the potentially higher protein content of low carbohydrate diets on renal function. Evidence from patients with type 2 diabetes with normal baseline renal function and from individuals without diabetes and with normal or mildly impaired renal function has not shown worsening renal function at one or up to two years of follow-up, respectively.22656667 Research in patients with more severely impaired renal function, with or without diabetes, has not been reported to our knowledge. Other potential side effects of a very low carbohydrate diet include headache, fatigue, and muscle cramping but these side effects can be avoided by adequate fluid and sodium intake, particularly in the first week or two after starting the diet when diuresis is greatest. Concern about urinary calcium loss and a possible contribution to increased future risk of kidney stones or osteoporosis68 have not been verified69 but evidence is sparse and warrants further investigation. The long term effects on cardiovascular disease and chronic kidney disease in patients with diabetes need further evaluation. Given the hypoglycaemic effect of carbohydrate restriction, patients with diabetes who adopt low carbohydrate diets and their clinicians must understand how to avoid hypoglycaemia by appropriately reducing glucose lowering medications. Finally, low carbohydrate diets can restrict whole grain intake and although some low carbohydrate foods can provide the fibre and micronutrients contained in grains, it may require greater effort to incorporate such foods. This has led some experts to emphasise restricting refined starches and sugars but retaining whole grains. Several countries in sub-Saharan Africa, South America, and Asia (eg, India and China) have undergone rapid nutrition transition in the past two decades. These changes have paralleled economic growth, foreign investment in the fast food industry, urbanisation, direct-to-consumer marketing of foods high in calories, sale of ultraprocessed foods, and as a result, lower consumption of traditional diets. The effect of these factors on nutrition have led to obesity and type 2 diabetes on the one hand, and co-existing undernutrition and micronutrient deficiencies on the other. In some populations, such as South Asians, rice and wheat flour bread are staple foods, with a related high carbohydrate intake (60-70% of calories).77 Although time trends show that intake of carbohydrate has decreased among South Asian Indians, the quality of carbohydrates has shifted towards use of refined carbohydrates.71 The use of oils and traditional cooking practices also have specific patterns in different populations. For instance, in India, the import and consumption of palm oil, often incorporated in the popular oil vanaspati (partially hydrogenated vegetable oil, high in trans fats), is high.78 Moreover, the traditional Indian cooking practice of frying at high temperatures and re-heating increases trans fatty acids in oils.79 Such oils are low cost, readily available, and have a long shelf life, and thus are more attractive to people from the middle and low socioeconomic strata but their long term effects on type 2 diabetes are unknown. Despite the nutrition transition being linked to an increasing prevalence of type 2 diabetes, obesity and other non-communicable diseases, strong measures to limit harmful foods are not in place in many countries. Regulatory frameworks including fiscal policies such as taxation for sugar sweetened beverages need to be strengthened to be effective and other preventive interventions need to be properly implemented. Efforts to control trans fatty acids in foods have gained momentum but are largely confined to developed countries. To reduce consumption in low and middle income countries will require both stringent regulations and the availability and development of alternative choices of healthy and low cost oils, ready made food products, and consumer education.80 The need for nutritional labelling is important but understanding nutrition labels is a problem in populations with low literacy or nutrition awareness, which highlights the need for educational activities and simpler forms of labelling. The role of dietary/nutritional factors in the predisposition of some ethnic groups to developing type 2 diabetes at substantially lower levels of obesity than European populations81 is poorly researched and needs investigation. Despite the challenges of nutritional research, considerable progress has been made in formulating evidence based dietary guidance and some common principles can be agreed that should be helpful to clinicians, patients, and the public. Several areas of uncertainty and controversy remain and further research is needed to resolve these. While adherence to dietary advice is an important challenge, weight management is still a cornerstone in diabetes management, supplemented with new developments, including the potential for the remission of type 2 diabetes through diet. We thank Sue Brown as a patient representative of Diabetes UK for her helpful comments and insight into this article. Contributors and sources: The authors have experience and research interests in the prevention and management of type 2 diabetes (NGF, AM, VM, RT, WY), in guideline development (NGF, AM, VM, WY), and in nutritional epidemiology (NGF, VM). Sources of information for this article included published dietary guidelines or medical nutrition therapy guidelines for diabetes, and systematic reviews and primary research articles based on randomised clinical trials or prospective observational studies. All authors contributed to drafting this manuscript, with NGF taking a lead role and she is also the guarantor of the manuscript. All authors gave intellectual input to improve the manuscript and have read and approved the final version. Competing interests: We have read and understood BMJ policy on declaration of interests and declare the following: NGF receives funding from the Medical Research Council Epidemiology Unit (MC_UU_12015/5). NGF is a member (unpaid) of the Joint SACN/NHS-England/Diabetes-UK Working Group to review the evidence on lower carbohydrate diets compared with current government advice for adults with type 2 diabetes and is a member (unpaid) of ILSI-Europe Qualitative Fat Intake Task Force Expert Group on update on health effects of different saturated fats. AM received honorarium and research funding from Herbalife and Almond Board of California. VM has received funding from Abbott Health Care for meal replacement studies, the Cashew Export Promotion Council of India, and the Almond Board of California for studies on nuts. RT has received funding from Diabetes UK for the Diabetes Remission Clinical Trial and he is a member (unpaid) of the Joint SACN/NHS-England/Diabetes-UK Working Group to review the evidence on lower carbohydrate diets compared to current government advice for adults with type 2 diabetes. WY has received funding from the Veterans Affairs for research projects examining a low carbohydrate diet in patients with diabetes. This article is one of a series commissioned by The BMJ. Open access fees for the series were funded by Swiss Re, which had no input in to the commissioning or peer review of the articles. The BMJ thanks the series advisers, Nita Forouhi and Dariush Mozaffarian, for valuable advice and guiding selection of topics in the series.
. Dietary fat and cardiometabolic health: evidence, controversies, and consensus for guidance. BMJ2018;361:k2139.
. Case 73: Reversal of type 2 diabetes by weight loss despite presence of macro- and microvascular complications. In: Draznin B, ed. diabetes case studies real problems, practical solutions.American Diabetes Association, 2015:271-4.
. Fixing dad.Short Books, 2016.
. The principles and practice of medicine.D. Appleton and Company, 1921.
. Nutritional intake in India, 2011-12, NSS 68th Round.Ministry of Statistics and Programme Implementation, 2014.